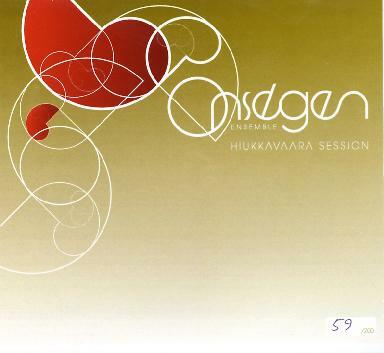 Onségen Ensemble - "Hiukkavaara Session"
This is a two track promo CD (only 200 made) by a very unique Finnish act called the Onségen Ensemble (3 core musicians with guests). The bands name and spirit are influenced by the Russian avant-garde composer, Onségen Olentkojev, who used zaum, which is a poetic language that emphasizes the auditive material and visual aspect of the language over the actual content. Vaino begins with a very King Crimson like guitar riff before the vocals appear when the track really becomes quite melodic. The singing is a bit like Emma from Garmarna at times. Aisa has a very beautiful voice which contrasts really nicely with the sort of hard harsh KC like riff. The band really freakout and go into some sort of free jazz space like Alien Planetscapes or Acid Mothers Temple half way into the track and then recover. Very cool stuff. Amazing actually. "Kuuhanka" is next and a bit longer track that slowly builds up and then really jams with some sort of chanting male vocals in the background as the intensity of the track builds and builds. There is really great playing by all members and a very cool guitar solo with loads of effects on the sound. This is just my kind of stuff. Where can I hear the next material by this band?? Totally amazing stuff. For more information you can visit the Onségen Ensemble web site at: http://www.uleaborg.com/onsegen.